This year’s holiday film releases have little direct LGBT content, but still offer many delights for gay audiences. 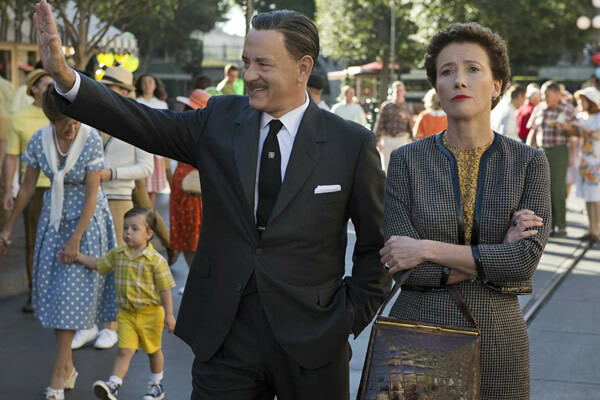 Opening Dec. 20 is “Saving Mr. Banks,” the story behind the making of the movie “Mary Poppins.” Walt Disney (played with great gusto by Tom Hanks) has promised his daughters that he will make a movie of the beloved book by P.L. Travers. There’s only one problem — the equally curmudgeonly Travers (Emma Thompson) does not trust Disney to treat her story with the respect she feels it deserves. He finally wears down her resistance, but the two continue to spar during the production of the movie (Travers, for example, hates the animated sequences). The film also features Colin Farrell as Travers’ alcoholic banker father (seen in flashbacks) and Jason Schwartzman and B.J. Novak as the Sherman brothers who wrote the famous score. Award-winning filmmaker David O. Russell (“Silver Linings Playbook,” “Three Kings” and “Flirting with Disaster”) is the director and co-writer of “American Hustle,” a fictionalized version of the ABSCAM scandals that rocked American politics in the late 1970s. The film stars Christian Bale as con man Irving Rosenfeld, with Jennifer Lawrence as his unpredictable wife and Amy Adams as Sydney Prosser, his seductive British partner in crime. Opening in D.C. today, the movie also stars Bradley Cooper as a wild FBI agent and Jeremy Renner as a corrupt New Jersey politician. Another fact-based tale of corruption, “The Wolf of Wall Street” opens on Wednesday (Christmas). The latest opus by Martin Scorsese stars Leonardo DiCaprio and tracks the rise and fall of wealthy stockbroker Jordan Belfort. Also on Christmas Day, “Mandela: Long Walk to Freedom” opens in wide release. Based on the late leader’s autobiography, the film chronicles Mandela’s life from his childhood in a rural village through his years in prison to his triumphal inauguration as the first democratically elected President of South Africa. The movie stars Idris Elba as Nelson Mandela and Naomie Harris as Winnie Madikizela. At the film’s London premiere on Dec. 6, Elba announced the news of Mandela’s death to a shocked audience. Also opening Wednesday is the gripping family drama “August: Osage County.” With a screenplay by Tracy Letts based on his Pulitzer Prize-winning play, the film chronicles the turbulent lives of the strong-willed women of the Weston clan who return home when their father Beverly (Sam Shepard) goes missing. Meryl Streep (likely to rack up another Oscar nomination for her performance) stars as the ailing, but still monstrous, matriarch Violet, with Julia Roberts, Julianne Nicholson and Juliette Lewis as her three long-suffering daughters. The powerful ensemble cast is rounded out by Dermot Mulroney, Abigail Breslin, Ewan McGregor, Margo Martindale, Chris Cooper and Benedict Cumberbatch. The increasingly popular Cumberbatch will also be heard as the voice of the dragon Smaug in “The Hobbit: The Desolation of Smaug” which opens Wednesday and features the return of openly gay actor Ian McKellen as the wizard Gandalf. On a lighter note, Ben Stiller takes on the title role in “The Secret Life of Walter Mitty,” a remake of the Hollywood classic based on the famous story by James Thurber. In addition to these new releases, some movies with LGBT content that opened earlier in the season will no doubt linger on area screens through the holiday season. “Philomena” tells the true story of an Irish woman (Dame Judi Dench) who was forced to give her son up for adoption. With the help of disgraced journalist Martin Sixsmith (Steve Coogan), she discovers that her son was a closeted advisor to President Ronald Reagan who died of AIDS. Also inspired by real events, “The Dallas Buyer’s Club” tells the story of Ron Woodroof (Matthew McConaughey), a homophobic straight man who is diagnosed with AIDS. With the help of transsexual Rayon (a bravura performance by Jared Leto), Woodroof fights the medical establishment by smuggling HIV drugs over the US border. Finally, gay playwright and activist Langston Hughes’ perennial holiday stage classic “Black Nativity” has been brought to cinematic life by director Kasi Lemmons (“Eve’s Bayou”). Hughes’ Christmas pageant is framed by a modern-day story of a troubled youth who embarks on an unexpected and inspiring journey. Already in local theaters, the film features high-wattage performances by Jennifer Hudson, Forest Whitaker and Angela Bassett.